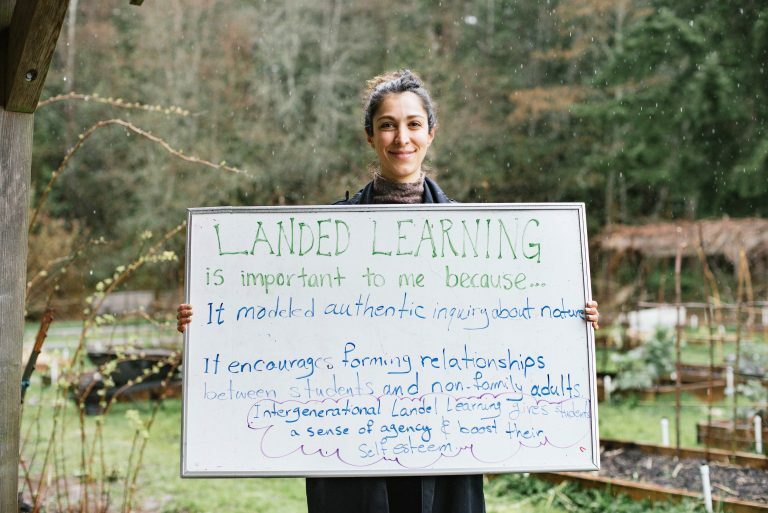 » Home » What does Landed Learning mean to you? 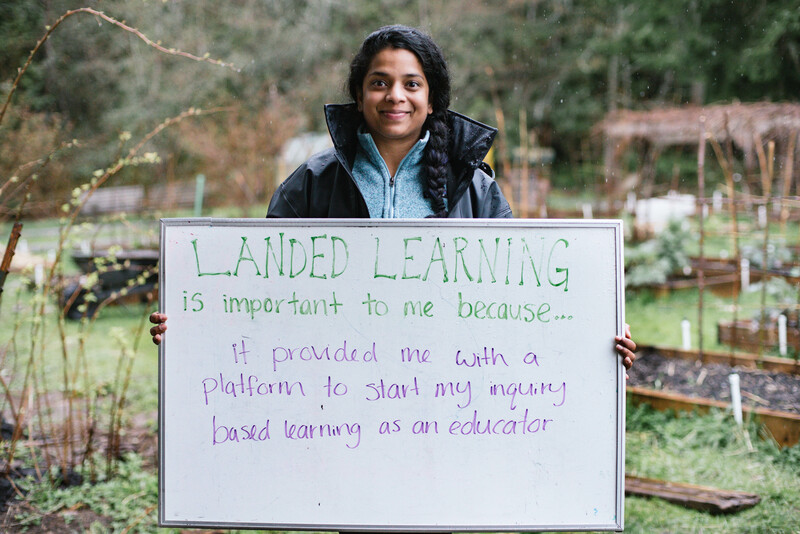 Landed Learning inspires communities. 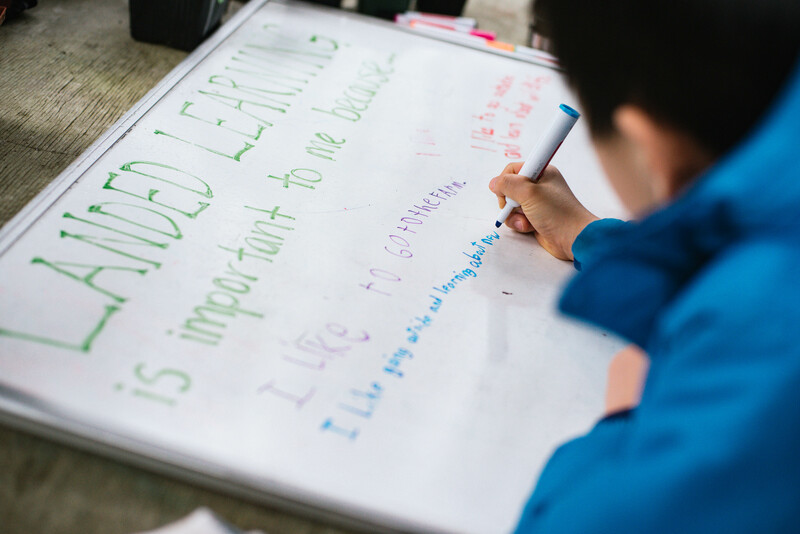 How has Landed Learning inspired you? Leave a note at the bottom of this page, learn more about our crowdfundraising campaign or donate now! 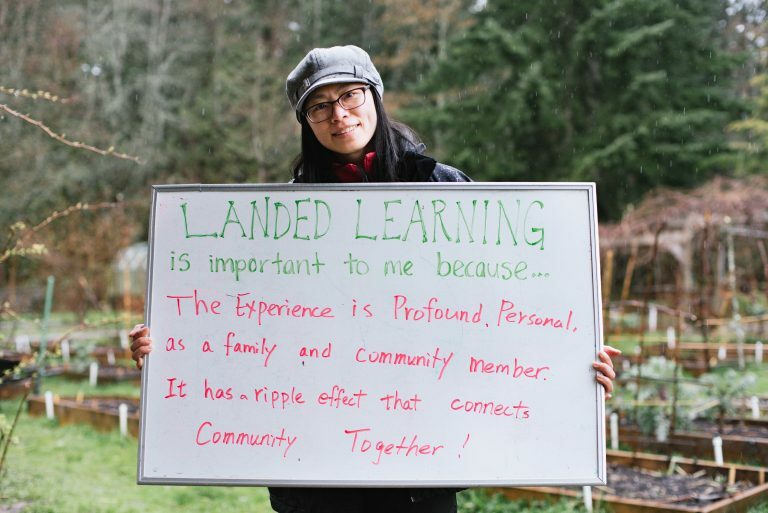 We invite you to share with us how you’ve been involved with Landed Learning and how Landed Learning has impacted you! My daughter participated in this program through her Elementary School (Edith Cavell). This program had the single most impact on her learning, motivation to learn and understanding that she is learning for a worthwhile purpose. The staff, teachers and all the wonderful volunteers created a learning environment for our children that is textbook “New BC Curriculum”. Our children had opportunities for self-directed learning, working in groups and following their passion. I can say with certainty that this approach worked for her – it has been three years since she participated yet she still talks about this experience and recalls facts and even recipes that she prepared at the farm. The interaction with other adults, particularly the volunteers, was of great value to my daughter. It helped her in developing the self-confidence to speak up and converse with adults, outside of family and school setting. 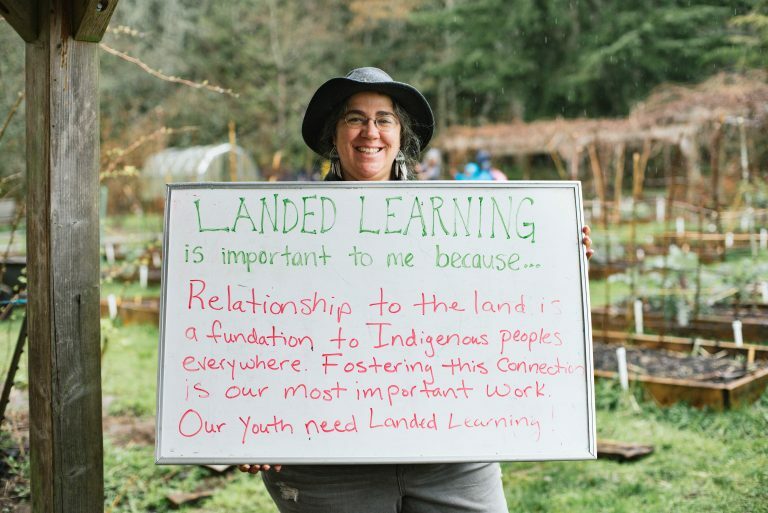 I’ve been a volunteer Farm Friend with Landed Learning for five years. I got involved because I wanted to work with children outdoors and help connect them to the natural world. My experience is that the students love being on the farm, in the forest and take an active interest in growing food. They are excited to be outside and notice the world around them with all their senses. I have met such wonderful people through Landed Learning from the staff, other farm friends, teachers and of course the kids. 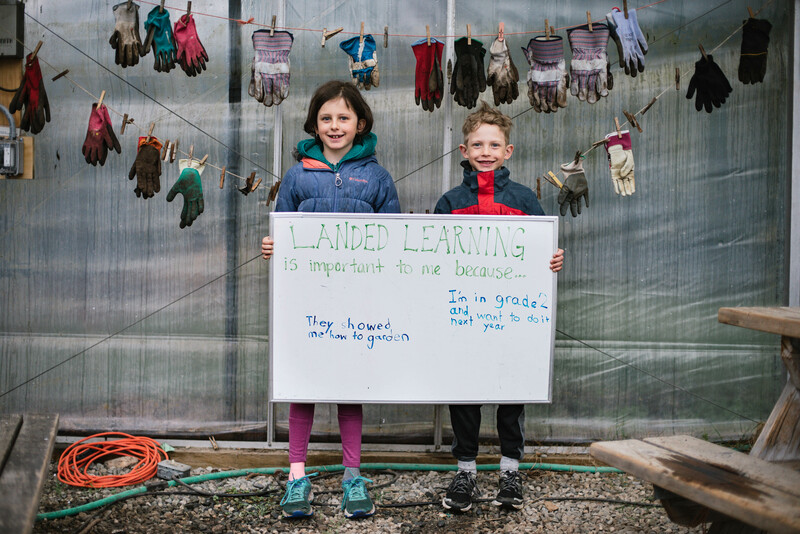 We need to keep Landed Learning growing and thriving because these students are our future leaders and this program assists them to become stewards of the environment. It also helps all of us build a caring, creative community of multiple generations where we get to learn from each other. What could be better? As a public health dietitian working in Vancouver, I have had the opportunity to participate in some Intergenerational Landed Learning activities and promote the project to children and youth, teachers, UBC students and volunteers. This unique, inspirational project provides hands on learning opportunities for all ages to engage with food throughout the entire food system in one location. It supports sustainability, research, mental well-being, connections between community members and the university and healthy habits that can last a lifetime. I have organized a tour for the national Dietitians of Canada conference in June 2018. The work of the UBC Landed Learning project was going to be shared during the tour to showcase their work as something that other universities could follow to create similar exceptional learning environments. I am a UBC alumni with a Master of Arts in Adult Education and a UBC Dietetics Clinical Instructor in the Faculty of Land & Food Systems. I urge the University to use their expertise, funds and creativity to come up with a plan to continue to support this invaluable project. I have been a volunteer with the Landed Learning Project for the last five years. As a farm friend I participate in building a relationship between the earth and children usually aged 8-9 years old. Every year it is beautiful to witness how from Sept to June these children become so skilled and aware of the earth , growing, sustainability, harvesting, cooking and so much more. They learn to work as a team and be part of a greater community. They become the next generation of stewards for our earth. Their love and respect for nature grows through the school year. I especially love how they go home and begin to teach their families what they have learned. Many families put it into practice. We have heard that years after being in the program the depth of experience, knowledge and practical application stays strong within them. It is a privilege to be a part of such an immensely important program for this next generation and the earth. I am grateful for I too have received growth, healing and transformation as a farm friend in this beautiful community. What a truly amazing experience this program has been for the students of Graham Bruce Elementary. 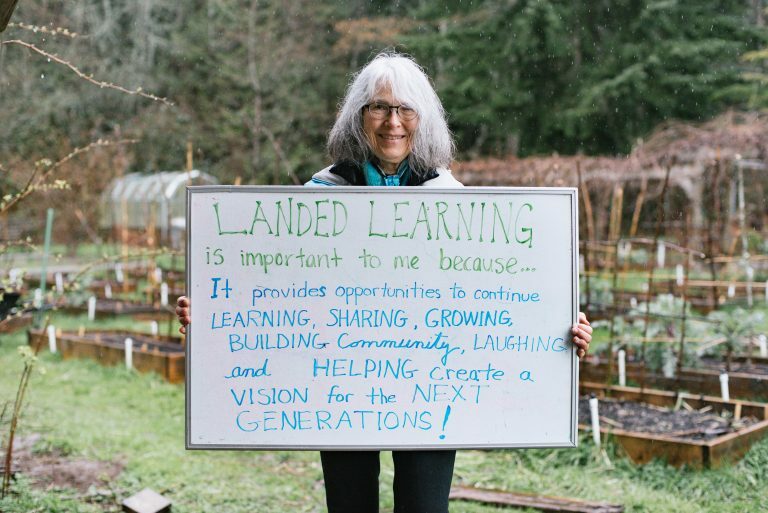 As a teacher in the Vancouver district for the past 36 years the Landed Learning Program was the absolute highlight of my career. Taking a class of grade 4/5 students over the twelve years that I had the privilege to do was an amazing gift to us all. Truly gaining an understanding and appreciation of how everything on our planet is so intricately connected was always a life lesson that my students and I became so acutely aware of. Students who struggled with the confines of the traditional classroom came alive, engaged and motivated to learn and share their ideas and discoveries. Students who lacked confidence, motivation or struggled with social emotional issues found a place where they could grow and gain a better sense of themselves and the positive attributes they had to offer as individuals. The amazing staff and farm friends who volunteer to make this program happen have truly made a huge lifelong impact on the hundreds of children that they’ve worked with. The proof of the type of impact Landed Learning had on my previous students always was confirmed during our Grade 7 grad each year when the students were asked to reflect and comment on their most memorable experience at Graham Bruce. Their smiles and fond memories that they openly shared about their Landed Learning experience was always at the forefront. 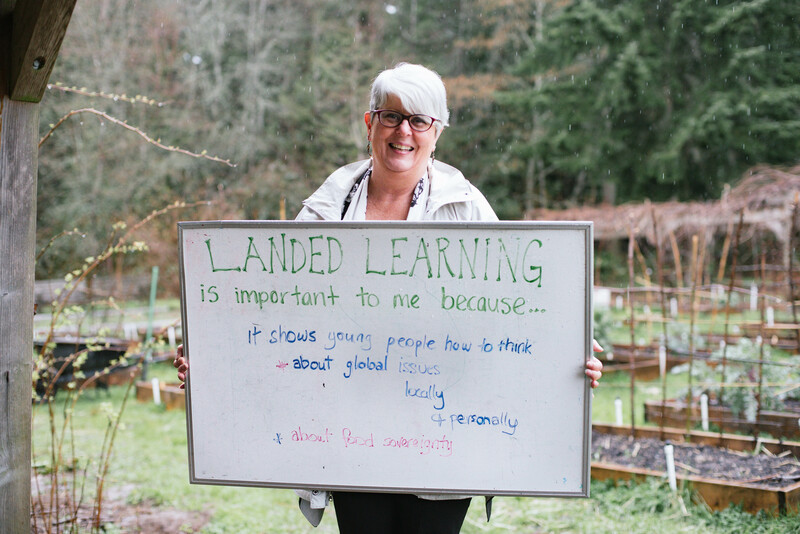 Thanks to Stacy, the amazing Landed Learning staff and to all of the incredibly, giving and talented farm friends who so generously gave their time and care to make this such an incredible experience for us all at Bruce. Landed learning has been an amazing experience for me. I feel like I have grown more than the students! The students I spent time with as a farm friend were remarkable. They frequently had surprising insights about the world. I believe one of the best approaches for developing long-term attachment to the earth and its ecosystems is through producing and cooking food for oneself. Landed Learning provides an incredible opportunity to do this and I wish every child had the chance to experience this program. Connections…to the land…to our nourishment…to each other. The Intergenerational Landed Learning Project has touched thousands of lives over its 15 years. I am happy to share a few of the ways it touched mine in order to help illustrate the impact that it has had on our community. The children, and our fellow Farm Friends are fortunate to have Stacy Friedman’s gentle leadership show us how to understand our environment, tend our garden plots and most importantly nurture our personal relationships with one another. As a research project, each week Stacy reminds us to think about what worked in the program and what we could do better. She actively takes this feedback to refine the curriculum to make it what it is. This gave me motivation to help (with some friends) to start a garden at our children’s school and to bring the curriculum that Stacy and her colleagues developed to a broader audience of children who could benefit from this important work. 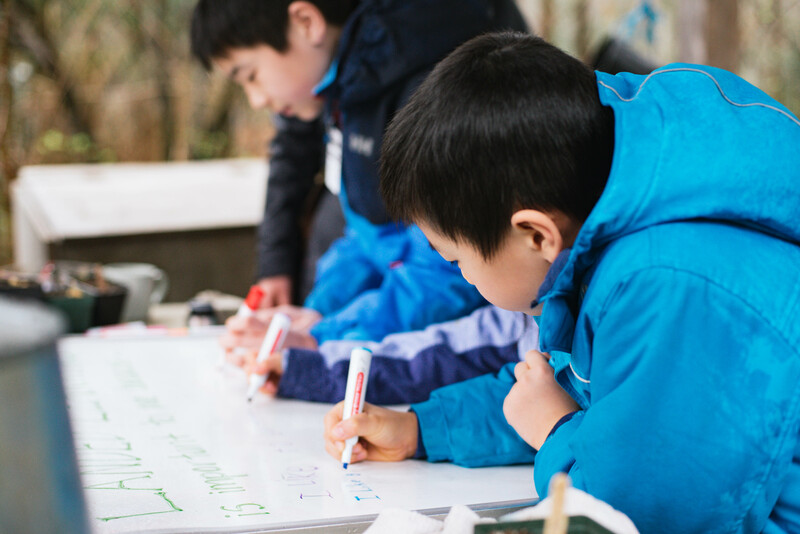 The (school) year-long Landed Learning program plugs us into the rhythms of nature and allows us to spend an extended period of time quietly observing the changes that take place in our gardens with the seasons. We also learn of the many ways that life on the farm is supported by the people who care for it, the sun that warms it, the rain and compost that nourish it, and the thousands of insects that pollinate and decompose it. We are able to gradually change our environment with hands-on gardening, growing nourishing food that we share with one another. This plugged me into a place and with people who together celebrate some of the most profound ways in which our world cares for us, and we care for it. There is a broad diversity of people involved in the project, both as Friends and as students. This diversity helps us think globally while acting locally. One activity in particular remains warmly in my memory as Stacy guided us through a tasting of a slice of strawberry. Over the course of about ten minutes we used our five senses to observe the strawberry and then discuss our experience within our groups. I recall that one student in my group had only lived in Canada for three weeks, and this was his first taste of a strawberry. As a life long lover of strawberries, I was a bit taken aback by this student’s reaction that the strawberry was sour and not to his liking! As I reflected, I realized that this was an honest response, and it turned into a real ice breaker for our group. From that point forward we all were enthusiastic to share these special farm experiences with our new friend and help welcome him to our country and gain a new appreciation of it from his perspective. My weekly scheduled visits to the farm over a period of 6 years as a Friend allowed me to connect with children of similar age to my own children, and I enjoyed guiding the 3-4 students in my care with my knowledge of how plants grow. Through this experience I was able to be a better Mum because the kids I worked with at the farm grounded me as I saw similar behaviours and attitudes with my own kids, and this helped me recognized the developmental stages that children experience, and socio-emotional challenges that they face. This gave me more patience and understanding with my own children and also with the students in the program. For the past 15 years, the Intergenerational Landed Learning Project has been a place where life lessons are learned by young and old(er) together. There is room in this program for each participant to have a personal and sometimes profound experience, while being part of a caring community. It is my hope that the project continues and that many more people can use the lessons that they learn here to help make our world be a better place. “Simply educating the citizenry to higher levels is not sufficient to attain sustainable societies. The term “re-orienting education” has become a powerful descriptor… an appropriately re-oriented basic education includes core principles, skills. Perspectives, and values related to sustainability…” (Lochman, 2007/2008). At this stage in history, when humans have altered the Earth’s balance to the extent to which many scientists are now naming our era the Anthropocene , it is urgent to consider the practice of sustainability as a means to offset such imbalance. We can no longer afford to allow the values of the past century to determine how we conduct ourselves towards our environment. As an educator, I strongly believe in the urgent need to promote sustainable practices in our students. 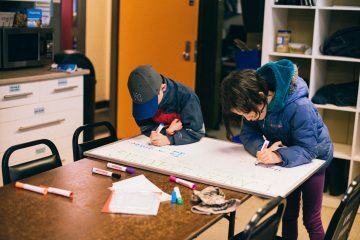 Although many Canadian schools are implementing recycling in the public school system, a further step is required to teach new generations core values and practices that will contribute to their lives in the future. That is why the Landed Learners project is an institution worth preserving, supporting, and expanding. 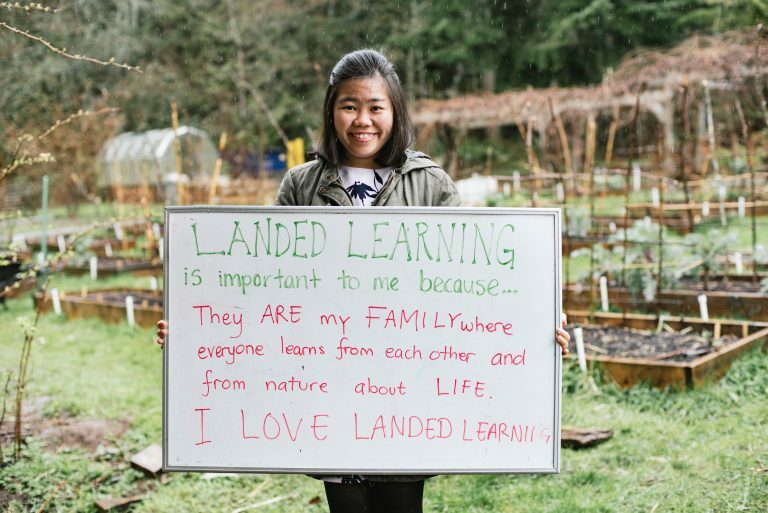 When I joined the Landed Learning Project at the University of British Columbia 3 years ago, it was a dream come through. Having taught for many years, I saw for the first time what I had always envisioned for all schools in British Columbia: a fully sustainable community of learners making connections between food consumption and production. I was impressed by the excitement of students able to explore the university farm and find how pollinators are essential to fruit production. As well, I was impressed to see how talented kitchen staff found creative ways to teach children how to prepare fresh food with fresh ingredients, and to help them make a connection between food and where it comes from. Children learn to ask deep questions, develop a thirst for knowledge and to respect small creatures. They also learn about the importance of pollinators, the life cycle of plants, and other essential notions and skills. The excitement shown by the children as they arrive at the farm says it all, as they come ready to learn and see with their own eyes what one can never learn in books. I consider myself fortunate to have worked under the leadership of Stacey Friedman, who in collaboration with other educators and researchers, provides insightful training to the docents, and is instrumental at promoting enquiry-based learning among the students. Stacey always schedules time for reflection not only among the students but also among the facilitators. 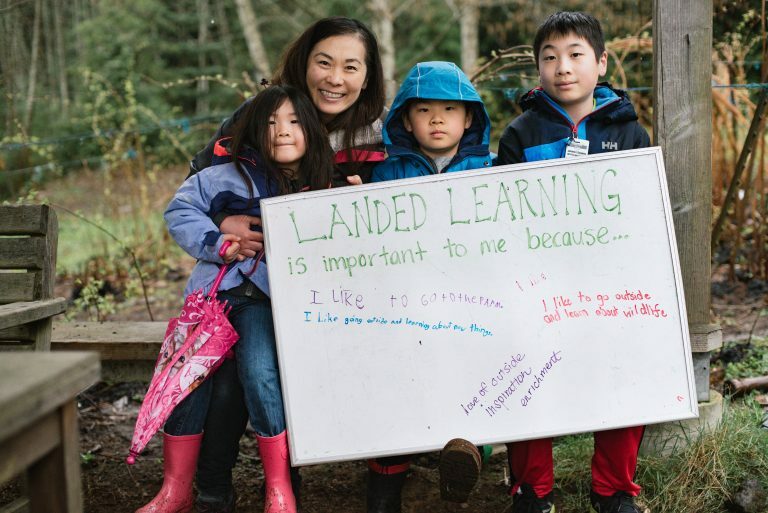 In summary, I consider the Landed Learning Project an essential complement to the BC school curriculum, and would love to see it develop satellite programs in other school districts, as the skills and values children learn are essential to creating sustainable communities. LL has inspired me over the years, in many different ways. It inspired me to be a Farm Friend, later to become part of the staff and Research Assistant during my graduate years at UBC. Literally LL inspired me to conduct my research for both my M.A. thesis and Ph.D. dissertation in garden-based learning. 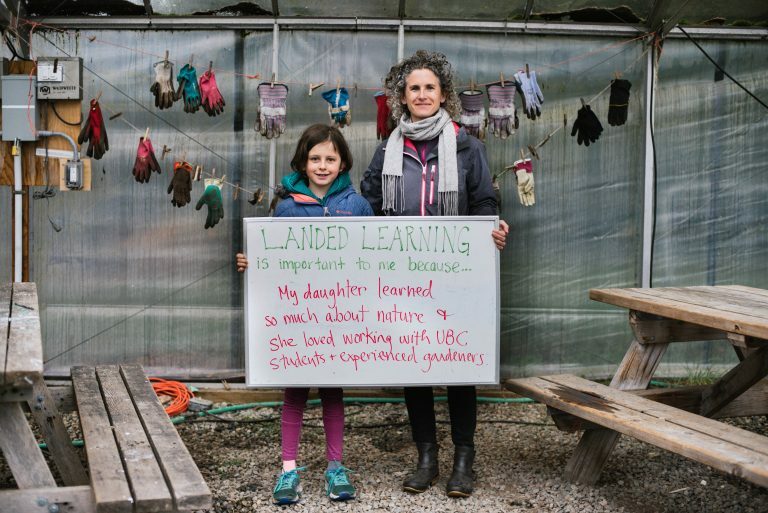 LL inspired me to engage deeply in the theory and practice of Garden-Based Learning and other related areas, it inspired me for 7 years to look forward to my weekly visits to the Children’s Garden at UBC Farm in which we cultivate learning across generations. It provides a living laboratory for undergraduate and graduate students to develop research projects, to grow their potential as researchers, teachers and leaders. It provides a safe environment for students, teachers, staff, community members, faculty, etc., to learn, play and grow. It promotes a community, in which everyone is valued and cherished. LL is important to me because It fights ageism and isolation by providing opportunities for seniors to participate in activities that are meaningful for them. LL is important because It provides children with opportunities to explore and wonder about nature. Leave a Reply to Teri Click here to cancel reply.